Does anyone have any experience with a decoupled third linkage or a reactive torque link in place of a solid upper link? From what I have read and can gather the decoupled linkage separates the tension and compression forces ie acceleration and deceleration forces. This is done to get the desired anti squat but without the detriment of a swing arm length being too short and inducing brake hop. I have also read that offsetting only the acceleration link and centering the brake link will induce some odd things to occur in one wheel bump and is generally not advised for street usage. I have also read that with a reactive torque link like the one pictured with rubber donuts in place will help keep the rear tires from breaking traction under heavy acceleration ie off the corner or from a dig by taking up some slack and softening the load until it can compress or deflect no longer. I am considering the system in the image from Coleman and offsetting the whole assembly 8-12% of the track width to the right. As well as keeping both links in line with each other as not to induce issues in one wheel bump. I also realize that on the Coleman unit a common pivot for both links would need to be made. Or this linkage kit from Rightfoot Performance. The only way the accel and decel forces can be "separated" and not "bind" is if there is considerable backlash between the two motions. You're slowing down towards a corner with shut throttle then you get back on the accelerator ... the backlash gets taken up (via the axle wrapping up) - Bang. Then you shut the throttle to change gear, let's say. Bang, Then you are in the next gear and on the gas. Bang. All the while your pinion angle is changing to and fro. How can this be a good thing? And now you have two almost-separate geometries to consider - and to find the right set-up for. Just do a 3 link with panhard. Move the upper link to the right of the diff housing if you so desire. It will cancel some of the driveshaft torque but not all of it, but it shouldn't be so asymmetric as to cause trouble when braking. Make the upper link shorter than the lower links (more antisquat as the rear suspension compresses - less as it unloads). Make the front end of the upper link height-adjustable so that you can fine tune how much antisquat you want. Have the shocks and springs act as close to the axle centerline as you can get - or on the lower links - so that the antisquat you dial in doesn't have secondary effects on the effective spring and damping rates. Have the lower links as close to horizontal as possible, and the panhard as close to horizontal as possible, at nominal ride height to minimize bump steer. No backlash, no binding, no uncontrolled axle wrap-up, one thing to adjust in the geometry - that's it. Done. Notice how many of these features you see here ... and they didn't bother with making the pivot points adjustable, they just figured out where the right spots are. And they didn't bother with driveshaft torque cancellation. Note how short the upper link is compared to the lower ones and how the lower links are very close to being parallel. winning is the goal but the predictability of their action/reaction can be. JMO. Jer73 wrote: This is done to get the desired anti squat but without the detriment of a swing arm length being too short and inducing brake hop. This is something that I do not understand; how "swing arm length being too short" induces "brake hop". Look at the back end of just about any front-drive car. Yes, I know you're not building a front-drive car. But under BRAKING, it's irrelevant that you are dealing with a "dead" axle rather than a "live" axle. The forces that the brakes apply are the same. About 90% of the time, maybe more, you will find some sort of trailing-arm-based design in those cars. In side view, the braking forces and torques are applied through trailing arm pivot points. Every front-drive with a twist-beam axle is like this, and there are lots of those - probably most of them. Almost every front-drive with a multi-link rear suspension (Focus, new Civic, VW Golf Mk5 and Mk6) uses a trailing link as part of the mechanism that guides the hub. All such suspension designs have VERY short effective side-view swing-arm lengths. If they were rear-drive, they'd have more than 100% anti-squat by far. I've never encountered "brake hop" with these cars under any circumstances, and that includes a wee bit of autocross and some amount of backroads silliness and the occasional hard stop. My Passat had a twist-beam axle. My Jetta had a trailing-link-based multilink IRS. I put hundreds of thousands of kilometers on those cars. "Brake hop"? Never! So why, under braking, would a live axle rather than a "dead" twist-beam axle suddenly make it prone to "brake hop"? I just don't see it. Maybe there's something else going on. But if too short a side-view swingarm length causes "brake hop" then why don't the 90% of front-drive cars that have VERY short side-view swingarm lengths have this problem? Maybe, but plenty of front-drivers have no worse weight distribution than many nose-heavy big-engined rear-drivers. And rear-drive vehicles with IRS often have comparable short-trailing-arm geometry for braking forces. Maybe the extra weight of the "live" axle compared to the "dead" twist-beam axle changes the resonant frequency so that it becomes within the operating range of a rear axle drive car, but the lesser unsprung weight of the twist-beam axle or IRS moves that frequency high enough so that it doesn't do anything bad. From a bit of poking around, it seems like the "brake hop" is mostly a 4th-gen F-body (i.e. OEM torque-arm) problem, but it isn't "always" a problem, and it seems like spring and damping rates have something to do with it and having too much rear brake bias has something to do with it. Making the upper link very short compared to the lower links - the way Ford did with the S197 - leads to a situation where under acceleration, the more it squats the more anti-squat you have, but under braking when the rear unloads, because the arms become more parallel, there is less "anti-lift". A torque-arm geometry can't do that. These are from Herb Adam's Chassis Engineering. One book calls for 42 inches the other calls for 60 inches minimum for side view swing arm length. Now as I understand it the higher % of anti squat in the system the more load the suspension will carry and transfer to the rear wheels. Too much and the rear end will lift the body of the car and worse case scenario with waaaaaay to much anti squat it would make the car hop on a hard launch. Now with braking forces and a high % of anti squat the torque on the housing is working in the opposite direction. SO instead of trying to lift the body on launch the brakes try to push the axle housing up into the body. If this is bad enough as stated in the literature the tires will lose contact and you then lose your braking until the axle sets back down and makes contact again then it is forced back up again ect..... I am sure brake bias plays a heavy role on this effect. As to how this affect is not noticed or measurable on a front wheel drive system I would assume most front wheel drive systems do not use much if at all anti's in their designs. I know that most independent rear suspension systems on the market have low or no anti squat percentages and when you start designing more anti's into the suspension it can get ugly and induce binding(I am paraphrasing here). As for it acting on a dead axle I would assume that is entirely dependent on it's mounting, geometry, and amount of unsprung weight. On a solid live axle I would assume that the extra unsprung weight would only exacerbate the hopping effect. The reason I brought up the decoupled upper linkage was because I can separate the the side veiw swing arm length from the antisquat % this would be a useful tuning tool for corner entry and exit at a road course or auto cross. Now please bear with me as I am learning mostly as I go, I do appreciate everyone that has posted so far and their advice. If I don't respond for a few days to someones response I either am trying to weed out info or i am just brain dead and can't think after work , again thank you. Brian P wrote: From a bit of poking around, it seems like the "brake hop" is mostly a 4th-gen F-body (i.e. OEM torque-arm) problem, but it isn't "always" a problem, and it seems like spring and damping rates have something to do with it and having too much rear brake bias has something to do with it. A regular torque arm cannot but a decoupled design can like Unbalanced enginering's solution for the 4th gen can. That explanation of the s197 makes a lot of sense as to why they went with such a short upper arm. Now I think the reason they didn't offset the upper link that they did not want to lose rear seat space. Now I have not driven a s197 mustang I have only gotten a ride along in a 2012 boss 302 with the track pack. From what I recall I had never been in a car like that, that could take a corner at the speeds we were going. Now that was about the time I had begun this whole project. Here is some back story the car is a 1973 Mercedes 280c The engine popped a head gasket and I could not source parts so the inline 6 m110 engine came out and a happy little .030 over ford 302 windsor with plenty of goodies went in along with a Tremec t5. Jer73 wrote: As to how this affect is not noticed or measurable on a front wheel drive system I would assume most front wheel drive systems do not use much if at all anti's in their designs. I know that most independent rear suspension systems on the market have low or no anti squat percentages and when you start designing more anti's into the suspension it can get ugly and induce binding(I am paraphrasing here). As for it acting on a dead axle I would assume that is entirely dependent on it's mounting, geometry, and amount of unsprung weight. On a solid live axle I would assume that the extra unsprung weight would only exacerbate the hopping effect. 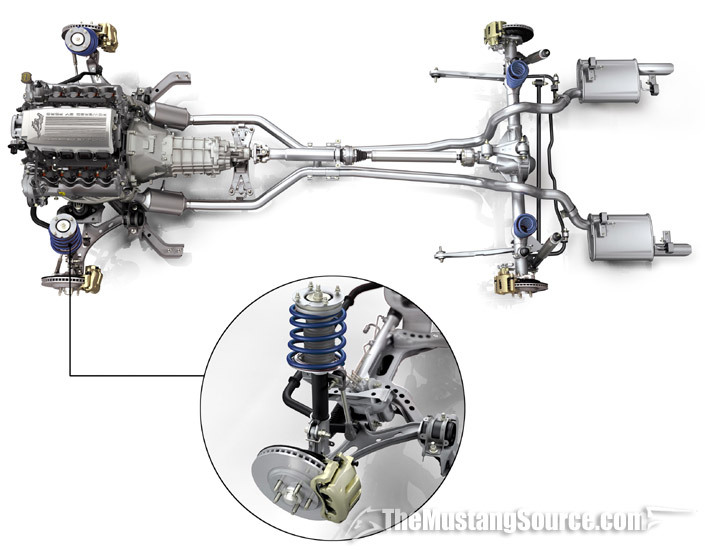 OEM front-drive twist-axle rear suspensions, and OEM front-drive multi-link designs similar to what Ford originally called "control blade" on the Mk1 Focus (which has since been copied many times including by VW for the Mk5 and Mk6 Golf based cars), have very short side-view swing arm lengths. Much, much shorter than what the two books that you quote suggest. The swing arm pivot is right at the spot where the trailing links attach to the chassis. Randomly selected image of a twist-beam from the internet ... the whole deal pivots around the front trailing arm mounts. Whatever the distance is from there to the rear hubs is the side-view swing-arm length. For the VW Mk5/Mk6 IRS, the "control blade" or "trailing arm" or whatever you want to call it actually bolts to the chassis in exactly the same spot where the twist-beam does, which means the side-view swing-arm length is exactly the same. Because the side-view swing-arm length is so short, these have VERY high anti-lift under braking. The braking torque on the hubs pulls down on the chassis end of the trailing arm pivots and of course that corresponds to trying to pull the hubs upward off the road. By the explanations given by Herb Adams etc., this should have horrible hop under braking. But they don't. Something else is going on when a live rear axle is involved - and it is quite possible that it has something to do with the considerably higher unsprung weight which causes the natural frequency to get into a bad range. I'm glad you understood the explanation of why the S197 suspension is the way it is, and it sounds like you had a good in-person demonstration of it as well! And you are probably right about the upper link wanting to be centrally located to avoid getting into rear seat pans. So here is a little update, I figured out the offset upper link after much head scratching. I sourced a panhard bar mount that I was able to adapt and modify. This gives me an adjustment range for the roll center of 5 to 11 inches. I didn't want to go much lower fearing ground clearance issues. Alright so now I am currious about choosing springs and swaybars. I have briefly played with some of the online calculators from some spring manufacturers and they are spitting out spring rates around 200lbs/in. Any preference on spring manufacturers? I am using a set of ohlins lmj 9 inch stroke shocks just for reference. 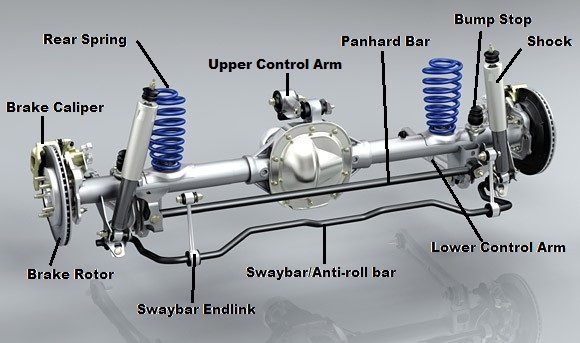 As for selecting a sway bar I am really not sure where to start. Brian P wrote: This is something that I do not understand; how "swing arm length being too short" induces "brake hop". Maybe it's an issue that mainly rears its head with high unsprung weight? My Golf and GTI (twist beam) would only lock and drag the rear wheels, one of which was usually hanging in the air at all times anyway. My RX-7 (4 link with maybe 10" long upper links) with SToCK rearend geometry and the proportioning valve removed would get into some bad rear brake hop coming down through about 30mph. I learned to drive around it, just ease off the brakes a little when coming down through that speed. But at higher speeds I could stand the car on its bumper with no problems? Now the weird part. That same RX-7 converted to 3 link, with a longer upper link that gave antisquat at suspension heights instead of near the end of bump travel, never exhibited this kind of brake hop. Very curious indeed. The rear suspensions you are looking at have been in use for decades in circle track racing. I will try to share what I have learned over the years about the three link system. Moving the upper bar to one side or the other, loads the closest tire more that the other on acceleration. The opposite happens under braking. On dirt cars, we move both the chassis end, and the rear end to the left to help with forward drive. This can also loosen the corner entry. The bushing pullbar is designed to aide with low traction, high horsepower set ups. The less traction, ex. IMCA Hoosier G-60s and a very dry slick track, along with a strong motor, would require softer bushings to "cushion" the initial shock of throttle application. If this is something that you really want to use, I would consider using a spring set up rather than a bushing one. As stated earlier, the bushings will wear out. The more "bite", the sooner they wear. The spring will stay the same. Linear and progressive springs available. The bushings are progressive by design. The brake bar must run uphill to the chassis. If not, it will allow the rear tires to try and lift up into the chassis. That's wheelhop. The acceleration bar is built to "float" on decal. The brake bar is built to "float" on acceleration. Remember, for every action, there's an equal and opposite reaction. Large amounts of anti-squat create large amounts of rear wheel unloading upon braking. My experience shows me that upper angle, not length, has a larger impact on anti-squat. We run around 18* down to the chassis on a dirt Modified. When I raced asphalt with a three link, the upper link was about 8-10* downhill. On asphalt, we were not allowed any type of brake bar or shock to control wheelhop. Also, with more available traction to the tires, we did not need as much anti-squat. I really hope this helps the OP out and makes sense. Your supports for your upper arm look quite far apart (at both ends). Have you calculated the tension force on that upper arm under maximum acceleration and calculated the stresses on the crossbar that the upper arm is secured to?